Launch your career and immerse yourself in a culture where you will have an immediate impact, working with industry leaders, iconic brands and passionate people. We hire the best and brightest minds who are excited about the work they do every day. Our fast-paced, collaborative environment empowers our employees to use their diverse backgrounds and degrees to help us bring more to the table. 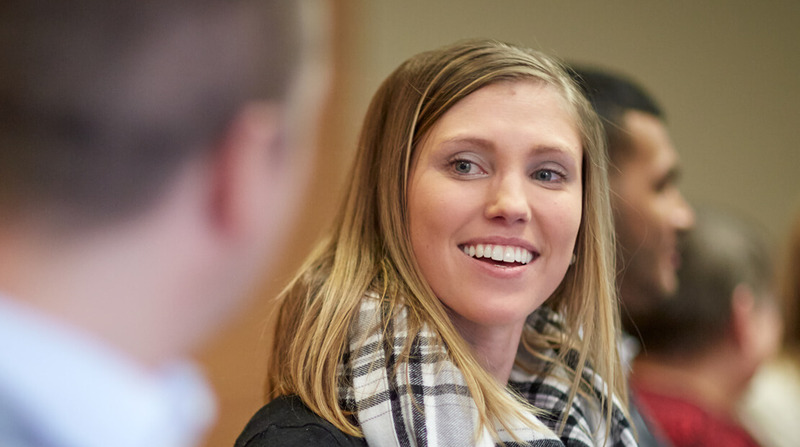 Hormel Foods has a strong promote-from-within culture that ensures ambitious and hardworking employees are rewarded and developed as future leaders of the company. We have a number of opportunities at our corporate office, our manufacturing plants and our sales offices that allow employees to pursue their passions and tap into their growth potential. As key partners on our team, staff accountants support a variety of departments in carrying out their business transactions and projects. Staff accountants also participate in management decisions that affect the short- and long-term goals of the company. Accounting employees undergo comprehensive training and are then assigned to cost accountancy, general accounting or internal audit. Driving continuous improvement in our plant operations with a focus on innovation, process flow and optimization is a key responsibility of our industrial engineers. Engineers can expect ongoing training to ensure their skills will be used and refined as they continue to grow their careers. Maximizing the operational capacity and potential at our locations is a critical responsibility of our maintenance engineers. They guide and direct teams of skilled craftspersons, maintenance technicians and other support personnel engaged in activities involving the installation, repair and maintenance of plant equipment and facilities. With a unique combination of experience in computer programming, systems analysis and systems support responsibility, our programmer analysts are involved in proactive, creative projects such as designing systems, and writing or customizing programs for internal customers and fellow employees. They are members of the company management team and are expected to be conversant in the business, applying computer systems to solve business problems. As a technology services analysts, employees will work on the infrastructure side of the company’s information technology department. Analysts will develop an understanding of basic infrastructure platforms and components, which include network design, monitoring tools, server administration and database administration. Responsible for the success of a department in one of our manufacturing plants, our production supervisors manage approximately 15 to 30 employees, leading them to achieve the department’s safety, productivity and quality goals. Their activities include scheduling products, coordinating transportation and supplies, verifying daily inventories, planning monthly meetings and motivating employees. Production supervisors make all departmental decisions, essentially running their own businesses within a business. An integral part of our process control team, quality control supervisors experience a great deal of variety in their jobs by consulting with management, managing quality auditors, providing leadership on quality in the facilities and approving product ingredients/labels to ensure nutritional compliance with company policy. Quality and process control supervisors also implement our Hazard Analysis Critical Control Point plan, oversee sanitation procedures and food safety, and collect and analyze data for new or modified product lines. The diverse set of our R&D team is comprised of food technologists, sensory analysts and research scientists, as well as a product development team. The R&D team works closely with marketing, operations and other R&D managers to create, conduct, analyze and report the results of research to these colleagues. The company’s success in developing breakthrough products that are healthier, easier to use and better tasting is a result of the solid teamwork and efforts of our R&D division. As the first point of contact with our customers and partners, our sales representatives are responsible for calling on a variety of contacts with the objective of increasing sales for their areas and/or divisions. They achieve increases by adding products to distribution and expanding the usage of existing Hormel Foods products. In addition, representatives are in charge of implementing marketing strategies for their products. Hormel Foods employs sales representatives across the company. If you don’t see a position that fits your background, send us an email, as we would love to talk to you about your career options. Take the first step in your career today.